If you ever have leftover rice, and you can’t make fried rice (like me), this simple Samoan recipe is a nice way to give it new life. I use the term “Samoan recipe” loosely though because wherever there are coconuts, there is a version of this dish. Thailand, India, the Carribbean - they even eat this in East Africa! There it’s known as wali wa nazi (wali = rice, nazi – coconut). 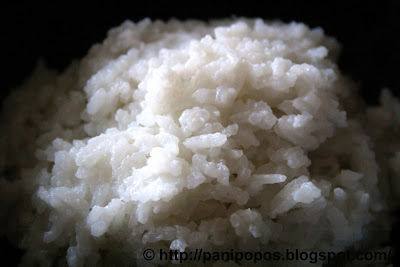 Ours is called alaisa (= rice) fa’apopo (= coconuttified). I’ll just stick to cooking. * Weight varies depending on type of rice. Wash the rice well. Put the rice and measured water in a saucepan and bring to the boil. Once it boils, turn the heat down as low as it’ll go, and leave to cook, tightly covered, for about 20 minutes until the rice is has absorbed all the water and the grains are cooked through. Turn off the heat. 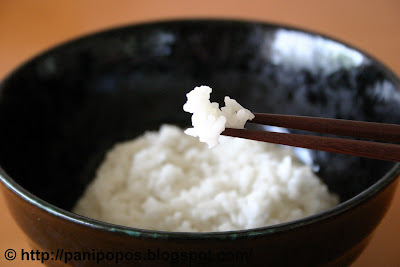 Add the coconut milk and salt to the cooked rice and combine well. Leave for about 10 minutes for the rice to absorb some coconutty flavour. If you’re using leftover rice, omit the water. 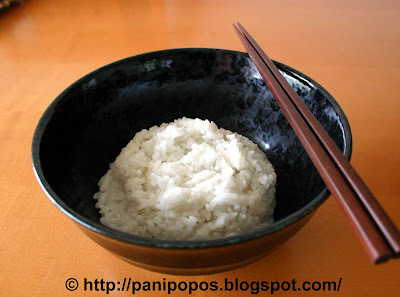 Simply mix the coconut milk with the salt in a saucepan, then add the rice. Cook over gentle heat until the rice is heated through, stirring frequently so it doesn’t burn. In Samoan cuisine, this is not a side-dish, more like a savoury snack. Wash it down with a hot cup of kokosamoa (Samoan cocoa), or a strong cup of coffee. And the chopsticks are for display purposes only. Samoans eat this with a spoon. First, can I just tell you I am so excited I found this blog! A friend posted it up on facebook. I have been wanting to know how to make panipopo, Samoan Cocoa Rice, and other Samoan food ever since my visit to Samoa in high school about 16 yrs. ago. You'd think I'd have found out how to make it when I attend BYU-Hawaii, but alas no. So, thanks for putting up this blog. I do want to know what kind of cocoa and how much to add though for the cocoa rice, if I can just use this recipe. Thanks!!! Glad you like the blog. I've been craving kokoalaisa for ages, but didn't want to post a recipe with normal cocoa until I've done one with authentic Samoan cocoa. So I got my sister to send me some and hopefully it'll get here this month. Fingers crossed! Hi panipopo. I didn't see your puligi recipe on here. Do you still have it? I'd love to write it down. I made your faapapa & me family absolutely ♥ it. Please let me know where I can find the puligi recipe. Faafetai lava & keep up the great work. Meitaki maata, faafetai lava, from a Cookie living in Europe and who yearns often for fresh kokonati island food. My absolute fav being palusami straight from the umu. Hey! I was browsing the net and looking for a coconut cake recipe and I landed on your blog. I am not Samoan but I love trying out recipes from different places and that's when I came across this one. The wali wa nazi part made me miss home. I'm from Tanzania so wali wa nazi is my absolute favourite way of making rice. fob life here I come! thanks for the recipes!